It has been a long week, ended with an even longer day. We went into the ER with Saoirse on Tuesday night, and were admitted because of her fever. She was started on antibiotics and some pain medicine. I was so frustrated that I went home, and Mike stayed with her. I had spent the night before at the ER, and I really was just spent - and still breaking out in hives. On Wednesday we regrouped with the doctors, although by then Mike was so exhausted, it was hard to stay focused. She received a blood transfusion and was started on morphine for the suspected mucositis, and blood cultures were taken to see if she had any bacterial infection. She was also started on prophylactic antibiotics. She was just miserably in pain. The mucositis was not visible in her mouth, but they could tell just by how she was acting that it was farther down her throat. I could tell she was hungary, but she just wouldn't eat or swallow. Although her cultures were not growing anything, Saoirse was still spiking fevers. The doctors weren't too concerned that it was anything other than the mucositis, but it was still hard to see her with so much pain and not much we could do to fix it. The only thing they do for mucositis is to let her heal herself as her counts rebound, and give her morphine for pain. When the counts start to rise, they will go to her mucus membranes first to work on healing the inflammation and sores. The next few days were spent with fevers spiking farther apart, and with a morphine pump to control her pain. She actually started eating some and drinking lots. And she was back to being playful. Constipation is a battle with morphine, so we tried to stay on top of it, but it was hard to balance all the meds. By Friday she was feeling quite well, and we even were able to take her outside for a little play time in the garden. We were hopeful that she would be going home the next day. Friday night was horrible. She was uncomfortable, so I had the nurse push her morphine pump to give her a little boost. At 1 she was woken up by vitals and wouldn't go back to sleep. She dozed a bit in my arms, but didn't want to lie in her crib. I had her morphine button hit a couple times, and finally some Benadryl to try and get some sleep, but it didn't last long. She was up again at 6:30. Turns out that what was bothering her was more the constipation, which the morphine was only worsening. We gave her some meds to help, and just had to wait for them to work. So after no sleep, and being constipated all night and morning, we were really looking forward to going home. She hadn't had a fever in over 36 hours, and she was happy and eating, albeit cranky and tired. Then, she all of a sudden went up to a 38 degree C temperature and threatened our chances of going home. On top of it, we had been moved out of our room (we were in a private, and there was a transplant patient coming over), and were in no-mans-land of a room because we were expected to be out of there. It was so frustrating. We couldn't get any peace and we were stuck. I just felt that the temperature was a fluke. Once she finally pooped, she was happy and playing and wanting to run around. She wasn't showing signs of feeling bad, and I was convinced that all she needed was a good night's sleep. We talked to the doctors, and after some hemming and hawing and a few tears, we agreed to see where she was after a nap and a couple hours. More waiting and more limbo. Of course I wanted to take her home no matter what, but Mike was going to make sure that we did what was best for her. Even though she was woken up from her nap, her temp did go down on it's own - it was 37.6 when she woke up. She played and Mike talked to the doctors. They still were leaning towards keeping her overnight to make sure that she was ok, but I still felt that what she really needed was a good night of uninterrupted sleep to start healing, and she wasn't going to get that in the hospital. The doctors agreed to send us home as long as her temp was still going down in an hour (it took that long for prescriptions and discharge anyway), and that we had to watch her like crazy to make sure she didn't show any signs of any kind of infection. I knew it was the best for her, and her temp was down to 37.2 in an hour, and we were on our way out the door. Of course they sent us away with tons of antibiotics and medicines for prevention of any infections, but I was much happier to do that and get her some rest, than to stay another sleepless night. Saoirse was thrilled to go home. She said bye to all the doctors, and we went on our way. She napped in the car, and we got home in time for some outside play before bed. She was happy and laughing, and other than getting her to take her medicine, it was an easy night. We checked her temp, still around 99 F, before bed, and she conked out! I checked her temp a couple hours later, still going down, and we went to bed. She did wake up when Mike went in to check her temp at 3, but she dozed for a bit, and was up for good around 5 (I'm pretty sure she was just really hungary by then). The good news - her temp was back to normal, and she was eating and drinking better than she had in days. This time, normalcy was the best medicine, and some dog loving. I trust the doctors and their judgement, but sometimes Mom still knows best. I've been following your story since I saw this in the Salem news. I pray that Saoirse is feeling much better today and will continue to pray that she best this asap!! I can't imagien what your going through. You are very couragous and Saoirse is adorable. my thought and prayers are with you all. I recently learned about the brave battle you and your daughter have been going through. I wanted to stop by and say hello, and leave my best wishes. 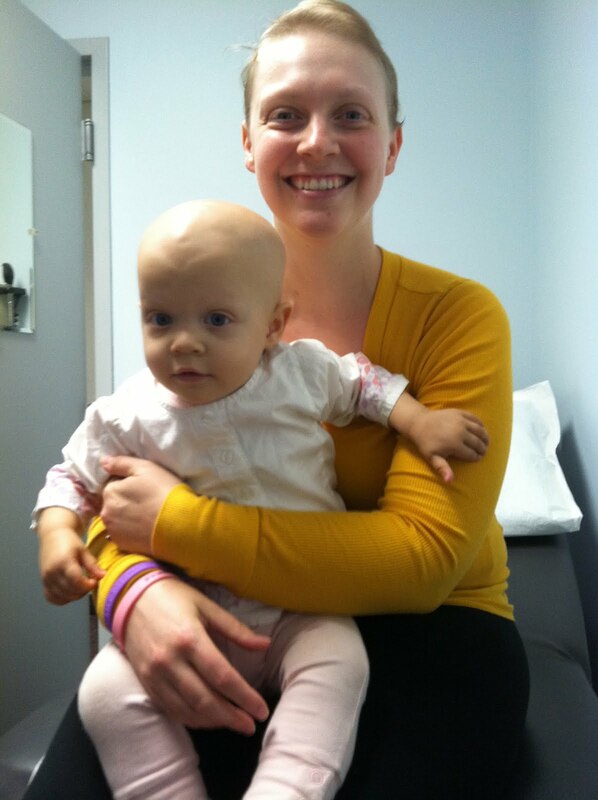 Neuroblastoma is an awful cancer, and it is so hard to watch the little ones fight it. My own little man Keegan was diagnosed at 3 months old. It was so hard watching him go through all he went through. Today he is nearly 2 and a half and recently celebrated 2 years since diagnosis and is now officially 1 year No Evidence of Disease. We still have a long way to go :( Every day we worry and pray he stays NED! *hugs* Hang in there and you are doing a wonderful job! The doctors are experts on NB, you and Mike will always be the experts on Saoirse. I am so glad you guys are home and happy. How are the hives? I just found your story. All the best to both you and Saoirse. I too have a Saoirse- Sunny Saoirse, 9 months. He is doing great! I believe you two too! Stay positive, everything is going to be all right! Love and peace cure!! !